-Brynn shared a gilded gold pumpkin DIY project yesterday. Probably the most stylish pumpkins I've seen. -Loving this feminine glamour Christine created in her daughter Scarlett's room. Fab job, lady! -Very honored to be sharing my home on 6th Street Design School today. Eeeek that grey jacket is sensational! Wow. That coat is gorgeous! It would be perfect for holiday season and all of the parties! I love that grey jacket and the wrap dress! Both are perfect for fall! Have a wonderful weekend! gorgeous picks! loving that jacket! My heart jumps every time I see those leopard booties, happy weekend Sam! gosh those madewell booties. I am IN LOVE. Loved your house tour today! That's awesome and so is that gray coat!! Love the feature! Your home is absolutely gorgeous! Beautifully styled! I've been swooning over those madewell booties!! they are just TOO Darn cute! thanks for the weekend reading! cute fall picks. Love the grey jacket!! So perfect for Fall. 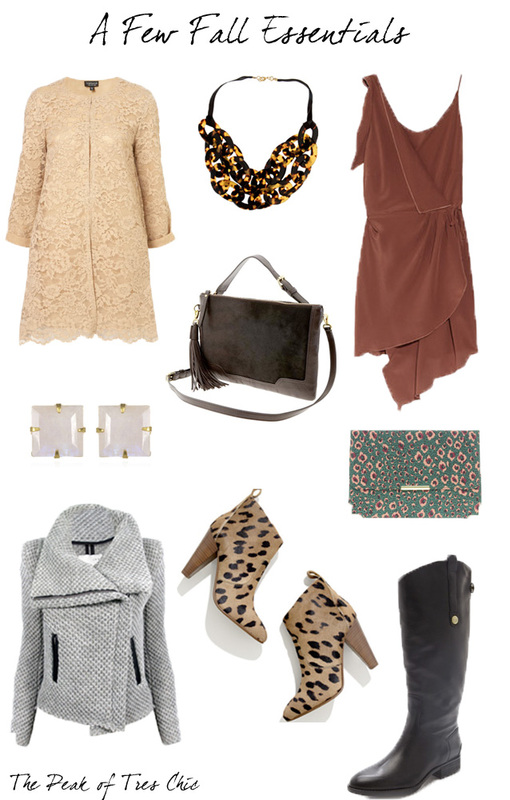 I am loving all of these picks for fall!!! Those Sam Edelman boots are everything!!! I have been on a non-stop hunt for the perfect fall boot & those are definitely up there on my list. And the tortoise bib necklace?!?! I NEED it in my life!!! !